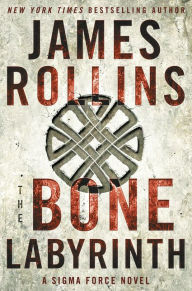 The Bone Labyrinth by James Rollins is a very highly recommended action/adventure thriller. This latest novel represents Rollins at his best; the plot is complex and the action non-stop, but I flew through the almost 500 pages at a breakneck pace trying to find out what happened next in all the various plot threads. In some ways I don't want to give away too much of the story, except to encourage fans and anyone who enjoys a great techno-thriller to pick this novel up for a great holiday novel. DARPA (Defense Advanced Research Projects Agency) and the Sigma force is back on the trail of a historical mystery that could give us answers to several questions about the evolution of human intelligence which geneticists and other scientists are seeking the answers to today. An archaeologist discovers in Croatia a subterranean cave that contains amazing paintings and treasures, but it also contains a Catholic chapel that holds the bones of a Neanderthal woman. Sigma members assist scientists as they try to uncover the mystery. Who were the people who created these works of art and why did a Catholic priest hide his discovery? The problem is that the Chinese military wants the discoveries/treasures for an entirely different reason: to continue with a series of unethical experiments they are conducting in genetic engineering. They also want a few scientists taken as hostages, but the Sigma force dead. Additionally they want a young gorilla, which is being raised and studied in the USA for the rate of growth of his of intelligence, captured and brought in for their cruel experiments. And that is just a small part of this globe-trotting thriller. The writing is impressive. Rollins keeps the various plots moving along quickly while proving information-packed storylines that are ripped-from-the-headlines fresh and topical. The key is the great job he does researching the ideas behind his plot. It all results in a great balance of action, science, and history. Rollins always includes a list of other books you can read if you want more information. He also makes it clear what is fact and fiction in his stories. I think The Bone Labyrinth could be enjoyed by anyone who likes a good thriller. Now I'm pretty sure I have read all the Sigma Force novels so I know the characters, but I don't think that any exhaustive background knowledge matters that much in this outing. Rollins gives you enough information on the characters for you to enjoy the novel. The real treat is the science/history/non-stop action he presents with his complex plots. I've said it before, and I'm going to repeat myself here, but I appreciate the fact that Rollins treats his readers with respect and a nod to their intelligence and ability to comprehend a complex plot. This is a stuck-over-night-at-the-airport book. Really. Get it if you are planning to fly anywhere for the holidays. It will keep you awake and entertained. Time will fly by even if you are delayed somewhere.